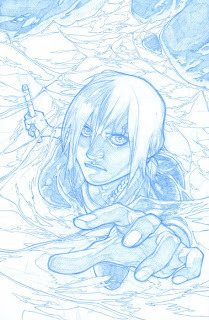 LOCKE & KEY is back under way now -- the third series, CROWN OF SHADOWS, is in the works, launching in November. And rather than show the cover image to issue 1 that was shown at Comic-Con, here's Gabriel Rodriguez' pencils for issue 2's cover. Just to give you something all-new. Inked and colored cover to come.